When a mysterious force decimates the population, only one thing is certain — if you see it, you die. The survivors must now avoid coming face to face with an entity that takes the form of their worst fears. Searching for hope and a new beginning, a woman and her children embark on a dangerous journey through the woods and down a river to find the one place that may offer sanctuary. To make it, they’ll have to cover their eyes from the evil that chases them — and complete the trip blindfolded. Initial release: December 13, 2018 (USA). Producers: Chris Morgan, Clayton Townsend, Scott Stuber. 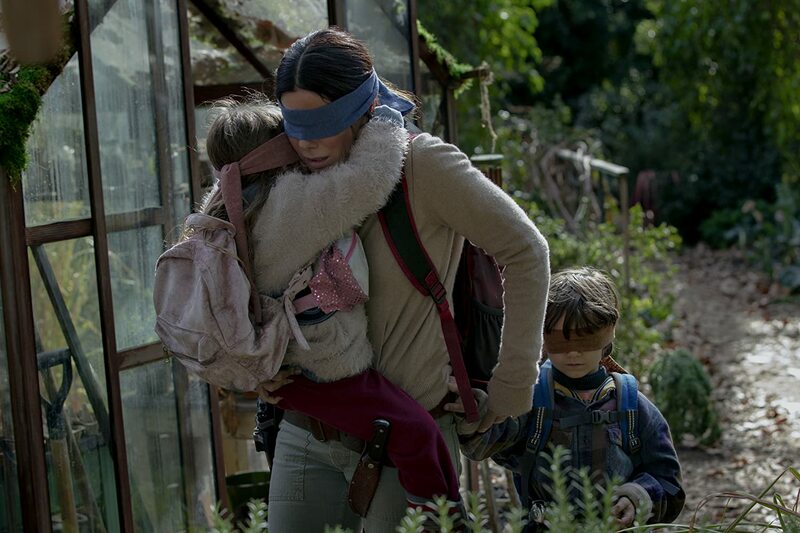 I just finished Bird Box and I’m quite torn about it. The novel is fast-paced and a real page turner. I devoured it in just a couple days and couldn’t wait to see how it ended. But now that it’s all said and done, I’m left with a tinge of disappointment. I feel like the ending left something to be desired. – The author wastes no time getting the action going. From the first chapter, I was invested and needed to know what would happen. There was no long hike to get to the good stuff; it was already there. – The plot is quite fast-paced, alternating between flashbacks and present-day events. You find yourself torn between needing to advance the story, and know where Malorie is headed with her children, but also desperately wanting to know the backstory here and how this dystopian future came to be. The author provides both, satiating you nicely. – The feelings of desperation, fear, anxiety, and helplessness that Malorie feels are palpable to you as the reader. I felt legitimate sorrow and fear for her. I felt quite invested in her well-being, especially after learning her backstory. She is a respectable, strong, and likable character. – The “creatures” really could have used greater development. Their behavior is inconsistent and erratic, making it feel almost as if the author doesn’t have a clue about them either and is just as much in the dark (no pun intended) as the characters. – In a similar vein, I found it very strange that everyone seems to know that, before the madness sets in, people see something. How would anyone know? Those who see it immediately kill others and/or themselves. Who is offering this news? How is this confirmed? Did someone see one, start to go mad, call the local news, explain what he/she saw, and then go on a killing spree? This plot hole felt a bit lazy. – Malorie’s children are the strongest, most intelligent four-year-olds on the planet. I would have found them more believable had they been six or seven, not four. Also, they are not superheroes. Explaining that the boy has the ability to closely identify the page number of a book his mother is on after hearing her flip through it is ludicrous. – Finally, just how unbelievable the survival of some of these characters would be. Imagining wandering a neighborhood or driving a car without sight, and always managing to come back with great new supplies, was just a little too much for me. Swinging a broomstick around as you walk and hammering a small stake into the ground to note your residence…I had a very hard time believing these activities would be as simple and effective as the characters would have you believe. So, overall, give it a read if you’re up for something spooky and thrilling. The book is quite unsettling and eerie and the author sets that tone very well. I just feel that more detail could have been used to really propel the story to the next level. I would definitely read more by this author in the future.